Disclaimer: This is an article about getting sick, particularly nausea and vomiting. If you are squeamish or anxious about this, reading this article may cause distress. In 2004 the Elementary School my daughter attended had an outbreak of the flu. She saw several kids vomit. She became afraid of getting sick. I have since discovered she was not alone. Over the years it has been my professional experience and personal opinion that the fear of throwing up or getting sick (nausea & vomiting) is far more common than reported in the professional literature and media. It is often missed as the core fear with anxious children. If we get calls from families who have used Turnaround yet still need some extra help it is almost always about this particular fear. It tends to impact school attendance, eating behavior and social interaction in such a way it cannot be ignored or accommodated. This fear is called emetophobia. Emesis is the Greek word for the act of vomiting. Phobia, from the Greek phobos, is an intense inflated fear. This phobia is a problem for adults and kids. I see both frequently. Dr. McCarthy and I have completed a supplemental program that is now available. It is necessary to understand “how” the fear works. If the “how” makes sense, the treatment makes sense. Most of the time people want to know “why” there is the fear but that isn’t nearly as helpful as understanding “how”. Let’s begin with a general explanation that would fit most sorts of anxiety but focused on emetophobia. 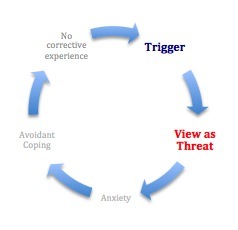 I am going to use a series of diagrams to explain the reinforcing cycle of this phobia**. First there is something that “triggers” or signals a threat to a person. It can be external as in seeing someone throw up or internal as in imagining someone throwing up. It could be external like a disgusting smell or internal as a gagging feeling. Any of the senses; sight, smell, taste, hearing and touch, could be involved in triggering the fear. A trigger isn’t inherently something bad. It is just information. Two people can experience the exact same trigger but one person is fine and the other gets alarmed. 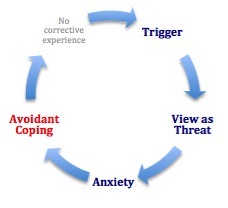 It is the next steps that give meaning to the trigger that make it part of an anxiety cycle. In the case of a phobia the trigger is misinterpreted as far more threatening than it really is. For example, throwing up is viewed not as unpleasant but as catastrophic. This threat seems so real or possible to the person because of how they mentally construct it. There is an important point to be made here. Fear of actual danger is not a problem needing treatment. No one gets therapy because they ran in the house after lightning stuck nearby. They get treatment because they get extremely anxious when there are just dark clouds so much so that it interferes with their lives. Human beings are designed to learn fear FAST and to extend the sense of threat to anything similar or related. I only have to step on a nail once to forever be careful walking through construction debris. This is a good thing. There is a solid logic to being scared by a nearby lightning bolt and then be on the lookout for future lightning bolts. However, a problem is beginning when the fear spreads to things associated to the specific threat that are imagined as far more dangerous than they are in reality. They key word is imagined. It is a mental movie about something that might happen. For example, lightening is obviously dangerous but storm clouds are not that dangerous. When someone is phobic the dark clouds become a mental movie of lightening striking and killing, therefore the dark clouds = lethal danger. In the case of emetophobia vomiting is misinterpreted as a threat. (Sometimes, embarrassment of vomiting in public is more of the imagined threat.) Then the mind spreads it to anything that might lead to vomiting like an uncomfortable feeling in the tummy or the “contaminated” desk of someone who got sick. This is still all normal. We misinterpret things all the time. Everyone imagines distressing things like this but it only occasionally leads to a phobia. There are more steps involved before it becomes a phobia. So there is a trigger, then misinterpretation, and then intense anxiety. 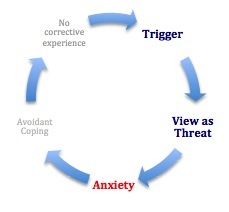 Although the imagined danger is not real, the experience of anxiety is real. That makes the misinterpretation seem much more plausible. When a threat is perceived the body prepares – dramatically. This process is often called the fight or flight response. Without going into too much detail, it is the body’s way of responding to danger – real or imagined. In the right circumstances this process instantly optimizes your body to survive. In the wrong circumstances it can become part of an anxiety disorder. Panic while running from a charging rhinoceros is good. Panic while sitting in a classroom, not so much. It is basically the same physiology but interpreted differently. Anxiety disorders are fundamentally incongruence between what a person is thinking and feeling compared to the actual situation. Using our previous example, the anxiety for an actual lightening strike is evoked by dark clouds. The physical reaction is just as strong for the imagined problem as for the actual danger. For emetophobia there is extreme distress at the possibility of vomiting. The anxiety leaps to anything that might lead to vomiting. (In one of life’s great ironies, anxiety causes stomach distress and then that evokes more anxiety.) The belief that it is a serious threat leads to the next step. This is the tipping point of something becoming a phobia. This step may be the key element in why someone develops an anxiety disorder. 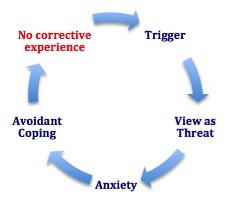 Everyone experiences the first 3 things but not everyone develops an anxiety disorder. The tipping point is when someone acts consistently with the misinterpretation. In other words, they behave as if the imagined fear is truly a threat. The main thing people do is avoid or escape the “danger” in a desperate attempt to get relief. When you are terrified, relief is AWESOME. People come back for awesome over and over. Then it becomes a powerful habit and even a compulsion. Because it does give relief it is very hard NOT to do it. Unfortunately, these kinds of behaviors interfere with living a normal life. At first it might not be that disruptive. But it gets bigger. For example, if you are afraid of getting sick first you may want to avoid a classroom but then you will want to avoid school. Getting to stay home gives relief. We all know how big a problem that becomes. Less dramatically, if the fear is contamination causing illness there could be extreme hand washing and cleaning. The urge to escape, avoid or fix can become ferocious. If you have tried to stop a terrified child from doing something to avoid the fear you know what I mean. Let me state again that avoiding authentic, genuine, and certified danger is NOT a problem. (Well, okay it is big problem but not regarding anxiety disorders.) Anxiety problems only happen when there is not an actual threat. Because the anxiety “feels” real and the avoiding “feels” better this becomes enormously influential. Because this becomes the norm, the next step seals the deal. When you avoid, escape or fix you don’t experience the things necessary to disprove the threat. Your misinterpretation doesn’t get corrected. In fact, over time you add more and more “proof” that it is really perilous. Not concrete or accurate evidence just more imagined proof. For example, if a child is afraid of vomiting she might begin to hyper-focus on how her stomach is feeling. What is going on in your stomach changes continually. At any given point in a day a person will likely feel some discomfort in his or her stomach. This normal discomfort is misinterpreted as increased likelihood of vomiting and is avoided if possible. She might change her eating habits if she thinks the feeling is connected to a certain food. That food is now additional “proof” of how likely she is to vomit. Stressful things cause stomach distress at times and so stressful things are avoided. Each additional association becomes more false evidence of threat. Because she is now worried most of the time, she will scan for evidence of threat and gradually “discovers” more and more potential dangers and the cycle continues. 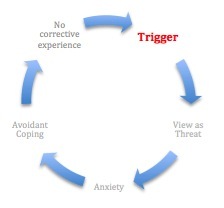 The triggers remain triggers because they are never challenged and repetition strengthens the cycle. More triggers are added and they become part of the cycle. Okay, let’s drop a simple example into this cycle. Here is something that seems quite ironic to me. Lot’s of kids are scared of clowns. They are supposed to be funny and likeable right? Anyway, imagine a young boy, Ben, at a circus. He is captivated by all the sights and sounds and doesn’t notice that a clown comes up behind the audience and does something noisy (which is what clowns do). (1. Trigger) The clown startles Ben with the loud noise, he turns and sees this wildly dressed “thing” (2. View as Threat) and he starts to cry (3. Anxiety). Ben turns away, buries his head in father’s chest and is so upset the family leaves (4. 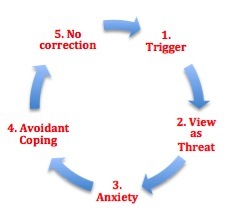 Avoidant Coping & 5. No Correction). After a few days, no one thinks much about it but a clown comes on TV. Ben, to everyone’s surprise, gets anxious and cries (1, 2, and 3). What happens next? The channel gets changed or Ben leaves the room (4 & 5 again). Clown triggers are pretty easy to avoid so to keep the peace the family makes sure no clowns are around (4 & 5 again). No one else in the family thinks clowns are scary but they don’t want to freak out Ben so they inadvertently add proof that clowns are dangerous by helping him avoid them. But then he goes to a friend’s house and there is a clown doll. It is close enough to the real clown so now clown dolls are scary and another trigger is added. The clown doll is avoided or removed. (1, 2, 3, 4, & 5). The cycle is reinforced and becomes more elaborate. Sometimes it jumps to any costumed characters – more triggers. It just has to be similar to the existing fear to become part of the cycle. So how does it work with emetophobia? No one likes to feel nauseated and sick. Vomiting is awful. Vomiting is NOT dangerous or threatening however. I’ll use the example of my daughter. One of my pet names for her is Lelu. Lelu is at school and sees several students get miserably sick and vomit. She sees, hears and smells it. (Step 1). Lots of kids are getting sick. She naturally thinks she could get sick. But she thinks it would be terrible physically and humiliating. She interprets it as far worse than it is (Step 2). She begins to fear getting sick (Step 3). She wants to stay home while the flu is going through the school (Step 4). I think we may have let her do that (can’t remember for sure) at first (we reinforced Step 4). She avoids anyone who might be sick. She avoids anything that might be contaminated with flu virus (Step 4 & 5). She starts to ask us if she is sick. She wants us to check her temperature. She wants reassurance she isn’t sick. We do that (Step 5). She washes her hands. We tell her she is fine but start to make accommodations so she won’t freak out (Step 4 & 5). The reason reassurance doesn’t fully work is because kids know you can’t promise they won’t get sick. No one knows. But it helps a little so they keep asking. We stop saying vomit or synonyms, we change the channel (there is a surprising amount of vomiting on TV, even kids shows), she scans her body to see how she is feeling, especially her stomach. Well, anxiety causes digestive distress. (Step 1, 2, 3, 4 & 5). So, one of the first things to do in treatment is to explain how this fear of throwing up works to a child. Someone afraid of this is seriously worried about vomiting. Explaining how anxiety works makes it less scary. Understanding gives a bit of control. It will also make the treatment make sense. First we suggest you use the cycle to explain something unrelated. Think of a time your child was a bit scared to do something new like ride a bike, swim in the deep end of the pool, go to camp, etc. Make sure it is something they are no longer afraid of and show how they went through the process. Here is an example. Annie, remember when you learned to ride your bike? We took off the training wheels (step 1) and you were nervous you might fall (step 2). You were really upset and worried (Step 3). You went into the house and refused to get on the bike at first (on the edge of step 4). But you let your dad hold you in the seat. He held you at first as you started to ride until all of a sudden you said, “Dad, let go,” and off you went. The cycle stopped because you didn’t do step 4. You faced the fear and realized it wasn’t that dangerous to ride a bike and so Step 5 didn’t happen because you had evidence it was safe enough. My 8 year old Daughter has a fear if throwing up. It is starting to control her life. She doesn’t want to go to school she doesn’t want to go to cheerleading. She cries and begs me not to send her. I’m not sure what to do for her and I don’t want to give into her fear … But it breaks my heart. I feel bad for her…. I started having these exact same feelings when I was about your daughter’s age. I would cry and never want to go to school from these fears, but I didn’t believe that it was anxiety. I would get stomach aches and that would make it worse. I would be afraid to go to school because of the fear of getting a stomach ache. It’s a terribly vicious cycle, and I’m so sorry that your daughter is having to go through that. However, if you can get her into therapy and even on some medication as soon as possible, that would be best. I never acknowledged or understood my anxiety at that age and over 10 years later it has only gotten worse. 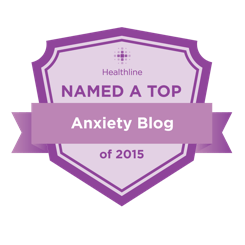 I never believed I had anxiety (I was convinced I had a health problem with stomach aches), but now I not only know for a fact that I have an anxiety disorder, but depression and OCD tendencies also. If it doesn’t get better, it gets worse. There’s no staying at a constant level forever. If she can help to recognize that her fears aren’t as scary as they seem right now, it will make her life so much easier in the future. Tell her that she’s definitely not alone! I am so relieved to finally see some realy guidance for this issue. I’ve suffered from it my entire life (I’m 47!) and sadly I seem to have passed it on to one of my boys. He’s 12 and a Nationally ranked tennis player. Unfortunately, after one incident during a match where he dry heaved and then panicked, has sparked an unmanageable fear in him every time he gets on the court to compete now. It’s crushing him, as his dream since he was 8 years old was to be a tennis pro. It breaks my heart to watch him fall victim to his phobia. I’m praying that your posts and your future videos will offer some relief. He has read the first two with me. He will also be speaking with Anna Christie, Emetophobia specialist. We both feel hopeful! I am thrilled he will be talking to Anna Christie, she is the best! LOVE!!! LOVE!!! LOVE!!! That this is being addressed by this wonderful team. We have your program and have gone through it, but emetophobia has been our ten year old sons issue for four years. Cannot wait to get the new CD!! very interested in this. my 12 year old son is scared of being sick, and then refuses to eat… i need help with this. Me too ;-; I know it’s the worsttt. This was very clear to both me and my husband. Thank you. I was exactly where you are when I was in middle school. I couldn’t eat lunch and never gained any weight as I grew taller. All I can say is that it helps to find help. Talk to a counselor, friend, therapist, parent. It’s not crazy or weird to have these feelings and there are plenty of people out there to help you. My parents told me that if I didn’t get to 100 pounds by 8th grade they would have to get me a feeding tube to get my nutrients. You don’t want to have to do that. For me it helped to eat a big dinner and snacks at home because eating at school made me anxious. Find whatever makes you feel better and eat your favorite foods because as hard as it may seem right now, being forced to eat lots of fattening foods is a blessing in disguise haha. I have a 15 year old with Asperger’s who has a fear of vomiting. Like most kids, he has gotten the stomach flu a handful of times in his life with nothing extraordinary about the event. However, any time he has indigestion, constipation, or gas, he convinces himself he will throw up. We end up playing 20 questions to try to “diagnose” his sensation to try to calm his fears he will probably not throw up. All that anxiety makes his stomach probably produce more acid and worsens his tummy ache. It is a vicious cycle that usually ends with Pepcid ac and a heating pad. I can’t imagine how I am going to teach him to take care of this on his own as an adult. Last week a kid threw up in the bathroom at school and asked for him to get the teacher. I think he did an about face and took off, but not before quickly washing his hands. Please help my 8 year old has constant fear of throwing up. He cries he don’t want to go to school. I don’t know what to do. I have an almost 5 year old son who appears to have inherited my fear of vomiting! He gets extremely upset/anxious when he sees others get sick, even in cartoons. He shows avoidance behavior and is having trouble going to his preschool. He also still refuses to poop on the toilet and has a tantrum and holds his poop until he has a pull up on. He has separation anxiety as well, which I also had as a child. I still suffer from emetophobia and I am almost 47! I don’t want my son to suffer like I have. I must say that I have always dealt with my 2 boys when they have been sick and they have never seen me panic because of it. I seem to be able to help them when needed but if I thought another adult or child was going to be sick, I would panic and avoid. It’s a fight or flight response. Is my son too young to see a therapist? What do I do? Hi i am 14 years old and have a huge fear of throwing up. Every time i get a little stomach pain or discomfort i freak out. this may be because when i was younger and got sick i just absolutly hated everything about it and get a bunch of ideas that make me freak out and feelings. I broke my arm recently and the only thing that scared me when i went to the emergency room was that i was going to throw up from the morphine and was freaking out about that and didnt care about my dislocated broken arm. i still am having anxiety about this and him just praying for this to go away and that i do not get sick. I have a 9 year old that seems to have the same problem as everyone commenting. She has seen a therapist for 7 weeks now and her condition seems to be getting worse. I feel like there should be something as parents we should be doing to speed recovery. What should we do? And is she too young for medication?!? Does she need it? We need help as well! I’m 16 and have been dealing with this phobia since I was eight or nine. The last time I got sick was when I had the stomach flu and I got sick twice in one day. As a young kid, throwing up didn’t scare me at all, I just found it displeasing. Now, thinking about being sick makes me have horrible anxiety. The worst thing is that a symptom of my anxiety is a tight/gagging feeling in my throat. I know it’s nothing more because when I’m able to calm down it lessens. My anxiety got so bad one day that I ended up gagging and it triggered my anxiety to be more severe. The last time I witnessed someone throw up was in the middle of March during first period when a boy in my art class got sick. It was horrible, and I had to go to the counselor and talked to them just to prevent an anxiety attack. Consequently, I started homeschooling the day after. Since then, my anxiety’s been worse. I’ve lost weight from being unable to eat and I have difficulty staying asleep at night. I see my doctor today so I’m going to ask if he can put me on some new medicine because even though they upped my anxiety meds dose, it’s not helping. My daughter has the same fears of throwing up. She is 12 in the 7th grade. This has been happening since 3rd grade and a kid threw up. It took me 3 weeks to get her back in school. We just switched schools and a child threw up. She has asked to move seats away from him and cries every night about going to school and wants to be home schooled. She has huge fear of throwing up. She says the school has too many sick people . I sent disinfectant wipes, lotion, and text her all day. She cries everyday going to school. I don’t know what to do. Do I put her back in old school where she could manage her fear or make her work through this? Please help! Can you recommend a practice for emetophobia in Delaware? I don’t know of anyone or a practice in Delaware but this is a good site for referrals: iocdf.org. My granddaughter is 15, it sounds like the same thing, is medication the best and only answer? She is loosing weight, so scared of getting sick she can’t eat or sleep light she needs to. What can I do to help?